This article shows how to use the TomTom Maps SDK for Android to create an application that calculates the time to leave previous to reaching the destination point at the desired time. The time they want to reach the destination. Optionally preparation time before the departure. The route is calculated and displayed on a map. The time to leave timer starts to count down. The route is recalculated each minute to check for any traffic delays. In case of any changes in traffic, the countdown timer gets updated and the user is notified. This article does not cover the whole of the application's code description, only the code sections where the TomTom SDK is used. You can find and clone the working application on our GitHub. Have fun with modifying it and testing our APIs! If you want to follow a step-by-step application creation from scratch, check out the “Search Along the Route” tutorial. To create a new API key, first log in or register on the portal. To get the users device location, a LocationSource class is used. This class uses LocationUpdateListener interface to notify about new location updates. The application needs to have proper permissions granted which is handled by onRequestPermissionsResult callback, so that location callbacks can be retrieved successfully. A PermissionChecker class is used to check whether the application has already assigned proper permissions. If not, then a requestPermissions function is called so that the user sees a permission request dialog. If location permissions have been granted inside an onRequestPermissionsResult function, a locationSource.activate() method is invoked. As a result, the application receives a GPS location in an onLocationChanged callback function. To feed departure and destination autocomplete text fields with the list of suggested positions, Results from the Search API query are used. A search word which is used inside a query. An AutoCompleteTextView object which is used to match whether an afterTextChanged event has been called from the departure text field instead of the destination field. Inside the searchAddress function, a searchApi.search(...) method is called. It takes a FuzzySearchQuery object as a parameter where you can provide necessary information like search results language, category, position etc. FuzzySearchQueryBuilder is used to build the FuzzySearchQuery object. withLanguage(Locale.getDefault().toLanguageTag()) - to return the results in default language on the mobile device. withTypeAhead(true)) - to treat the searchWord query as a partial input and search service enters a predictive mode. withMinFuzzyLevel(2)) - to set the fuzziness level to use normal n-gram spell checking. Feel free to experiment with other fuzziness levels. The search method from the searchApi object, returns a FuzzySearchResponse observable object. When search operation is finished, it emits either a successful value or an error. If a successful value is emitted, a method named onSuccess is executed in the subscribing DisposableSingleObserver, otherwise an onError method is executed. The same searchAddress function is used in the destination text field control. If there are any results in the FuzzySearchResponse object and the current location is known, then it is added to the departure autocomplete list of suggestions as a first option. Then this list is filled with addresses from the FuzzySearchResponse object. When the departure position is set, the user can choose destination position, arrival time, preparation time and a travel mode. All these parameters are gathered and passed to a CountDownActivity.prepareIntent method. A CountDown activity uses map and routing modules from the TomTom Maps SDK. It implements an OnMapReadyCallback interface, so that an onMapReady method is called after the TomTom map is ready to be used. After the startActivity method is called inside a CountDownActivity.onCreate(...) method, TomTom services and all other settings gathered from previous activity are initialized. The tomtomMap private field is initialized. An 'in progress' dialog is displayed. A requestRoute method is called. 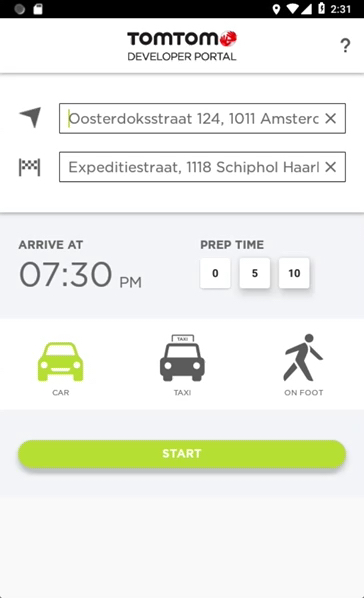 The CountDown activity uses TomTom Routing APIs to perform routing requests and operations like drawing a route on the map or displaying start and end route icons. First, a private RoutingApi class member is declared and initialized inside an initTomTomServices function which is shown in several previous paragraphs. A date which determines expected arrival time. There is a check whether the application is not in a pause mode in the first line of the requestRoute function. If the application is in the pause mode, a requestRouteRunnable object is posted in a timerHandler with a one-minute delay. If the application is not in the pause mode, the RouteQueryBuilder object is used to prepare a routeQuery object. WithRouteType - to allow the users to select one type of route from: fastest, shortest, thrilling or eco. WithConsiderTraffic - when enabled, current traffic information is used during the route planning, when disabled - only historical traffic data. withTravelMode – you can choose one of the following: car, pedestrian, bicycle, truck, other params are listed here. withArriveAt - a date and time of arrival at the destination point. It’s an important method inside the application because it changes a departure date which later is used to calculate time left before the departure. When the routeQuery object is created, it is passed as a parameter to a planRoute function from the routingApi object. This function returns a RouteResponse observable object which you can subscribe to using for example DisposableSingleObserver<RouteResponse> object. In case of an error, an onError method is called, inside this method the current activity is finished. As a result, the application returns to the previous screen. When the planRoute function is finished, an onSuccess(RouteResponse routeResponse) function is called and proper actions can be executed. The most important task in previous code example is to get a current travel time and compare it to the previous one. If travel times are the same, a Snackbar notification is shown to the user informing him, that there are no changes in the route time since the last check. Otherwise a travel time difference is calculated and stored in a travelDifference variable. Then, a snackbar notification is shown to the user with the calculated travel time difference. Next, the current travel time is stored in a previousTravelTime variable. The route is displayed on the map. The setupCountDownTimer function takes the departure date as a parameter. It checks if there is already a countdown timer service already running in the background, and if there is, it cancels it. Next, a current date is stored in a currentDate variable and the preparation time taken from the first activity is stored in a preparationTimeMillis variable. A time difference between the departure time and the current time is stored in a timeToLeave variable. It is later passed to a CountDownTimer constructor. The first callback is called onTick(long millisUntilFinished). It updates time info and checks whether the application is in a preparation mode. If this is the case, the color of the timer text views changes, and a preparation dialog is displayed to the user. onFinish() is called by the timer when counting down is completed. In this function, requestRouteRunnable callback is removed from timerHandler’s queue by calling removeCallbacks method. The color of a timer text views is updated again, and final alert dialog window is displayed to the user with nicely designed message that there is a time to leave! This tutorial describes the TomTom SDK and APIs used to build a Time To Leave application. Source code can be downloaded from Github.